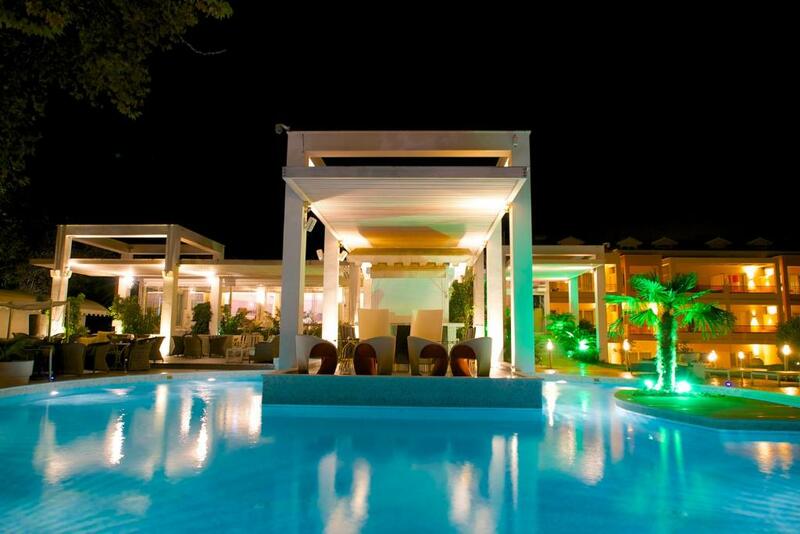 Lock in a great price for Litohoro Olympus Resort Villas & Spa – rated 8.8 by recent guests! Great location and facility. Perfect combination of mountain, seaside and luxury. Must try the beef burger from the snacks menu ! Breakfast was wonderfull for us. it was delicous and various kind of food. Interior of lobby was excellent more than I expected. I took several photos with my children at the lobby. All staff were very kind and helpful. The facility and the location were great. Perfect combination of mountain, see and comfort. 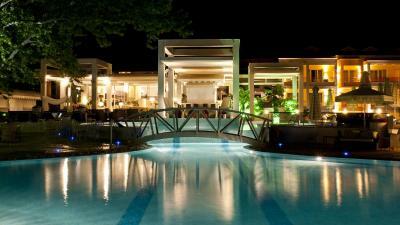 This hotel is located near the Olympus and you can use it as a base to your tour. in addition if you come with your kids you can use the Pool in your "private" yard. 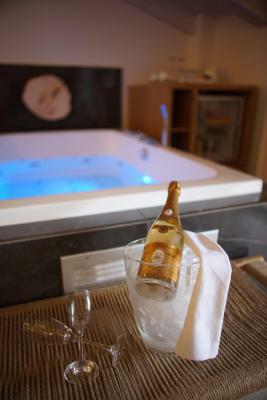 You also can use the Jacuzzi in your room. 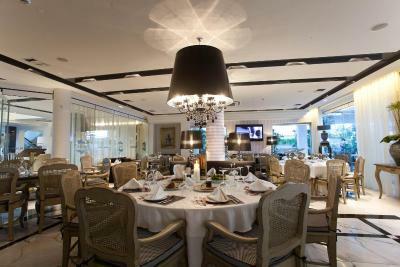 The room was very spacious and the breakfast was excellent! The staff are not thr worst in comparison that it is Greece. However what i did not appreciate is the fact that they always tried to rip us off. Rooms are comfortable only if it's a suite, more space and hot tab. The standard room only has shower ...there's no bath tub. The bed is comfortable, plenty of linnen, fresh towels and bathrobes. The rooms are spacious and clean. We had also a jacuzzi bathtube in the room. Very nice for a couple, less for a family. The view on the Olympo mountain was great as well as for the SPA, simply amazing. All in all we had a great stay, probably being here in low season period, it helped. Litohoro Olympus Resort Villas & Spa This rating is a reflection of how the property compares to the industry standard when it comes to price, facilities and services available. It's based on a self-evaluation by the property. Use this rating to help choose your stay! 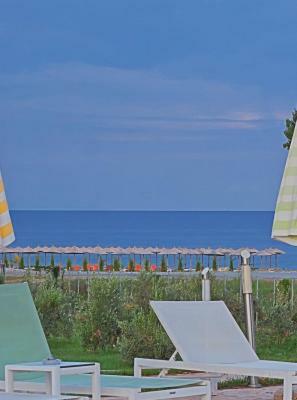 One of our top picks in Plaka Litochorou.Litohoro Olympus Resort Villas & Spa is in the Plaka area of Litohoro, only 300 feet from the beach with a view of Mount Olympus. It is surrounded by a garden with organic products. Free Wi-Fi is provided throughout the property. The spacious and sunny rooms open to a balcony or patio with sea or mountain views. 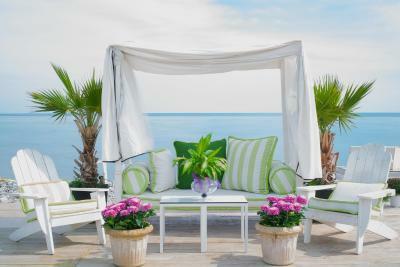 Each is modern with a sitting area with a luxurious armchair. 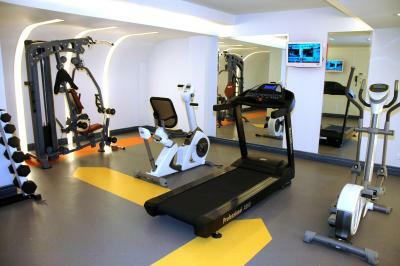 Facilities include air conditioning and a 32-inch LCD satellite TV. 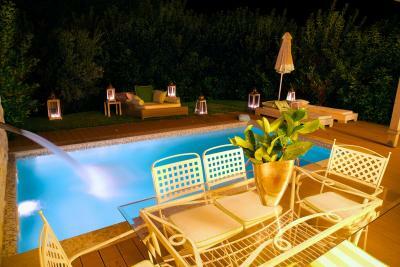 Villas with a private pool and a fireplace are also available. 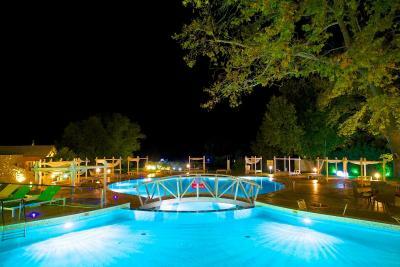 Litohoro Olympus Resort Villas & Spa is 2 miles from Litohoro and only just over 1 miles from Mount Olympus National Park. The city of Katerini is 7.5 miles away. Free private parking is available on site. When would you like to stay at Litohoro Olympus Resort Villas & Spa? On the ground floor, this spacious room has a private bathroom with shower and private balcony with view of the grounds. 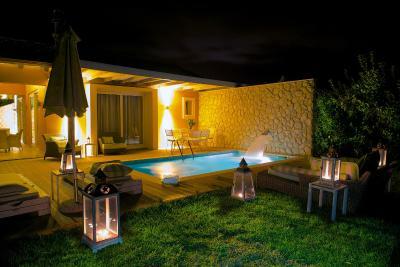 Spacious one-bedroom villa, with bathroom with shower, hot tub and fire place. 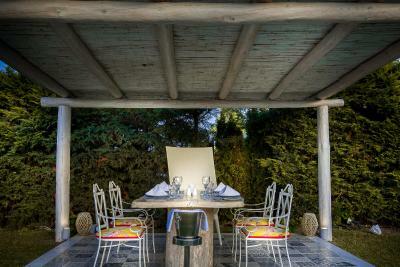 Has sitting area and private garden with outdoor swimming pool. Very spacious room with private bathroom with shower, hot tub and fireplace. Has 2 private balconies with views of Mt. Olympus. Spacious room with private bathroom with shower and private balcony with Mt. Olympus View. This room can accommodate an extra child. You need to contact the owner first. Spacious room with private bathroom with shower and private balcony with sea view. 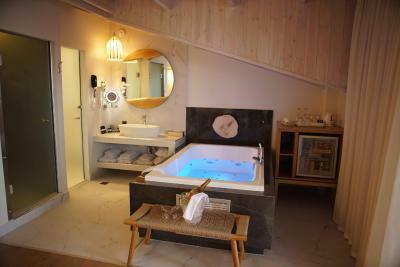 Spacious 2-bedroom villa, with bathroom with shower and hot tub and fireplace. Features sitting area and private garden with outdoor swimming pool with sea view. This double room has a balcony, sitting area and patio. This family room has a balcony, mini-bar and patio. This double room has a sitting area, patio and minibar. 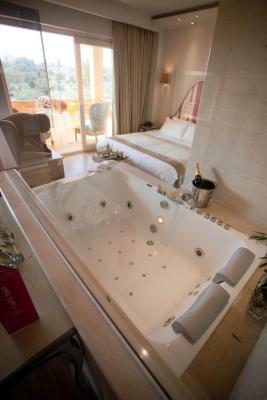 Featuring a private pool with hydromassage jets and a waterfall, this VIP Villa has an elegantly decorated bedroom and a living room, a bathroom with spa bath and a separate shower. - tea time with sweets. 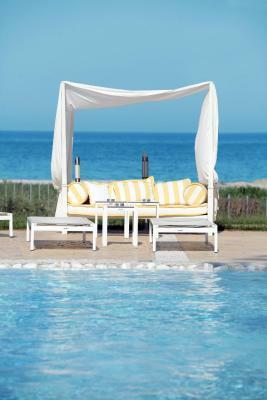 - private VIP luxury sun lounger on the beach every day. Luxury, grace, lavishness and workspace supreme – the Executive Olympus Suite has majestic floor to ceiling windows and sliding doors from the elegant, offering a superb panoramic view of the hotel and the Mythical Olympus Mountain. 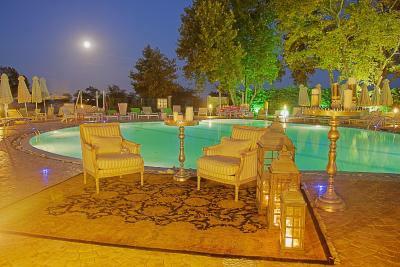 With beautifully designed table and chairs, several antique furnishings, a huge bathroom with spa bath with sweeping view of the Olympus Mountain and a separate shower for luxury and comfort. At the extra large balcony you can use the outdoor hot tub with the perfect Olympus Mountain View. This suite also features a satellite TV with large plasma screen, DVD player and home video system with surround sound and a music system, fast Wi-Fi Internet, mini-bar, individually controlled heating/air conditioning and a self-programable safe. You can also use the Suite Telescope to observe the Olympus Mountain. This suite has majestic floor to ceiling windows and sliding doors from the elegant, offering a superb panoramic view of the hotel and the Mediterranean Sea. 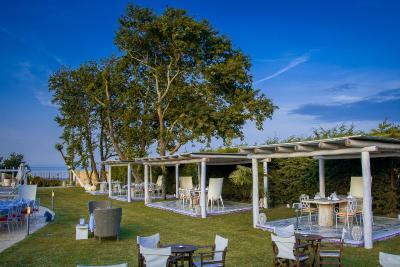 With beautifully designed table and chairs, several antique furnishings, a huge bathroom with spa bath with sweeping view of the Mediterranean Sea and a separate shower for luxury and comfort. 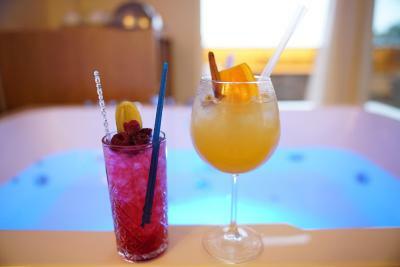 At the extra large balcony you can use the outdoor hot tub with the perfect sea side view. The Executive Mediterranean Suite also features a satellite TV with large plasma screen, DVD player and home video system with surround sound and a music system, fast Wi-Fi Internet, mini-bar, individually controlled heating/air conditioning and a self-programable safe. 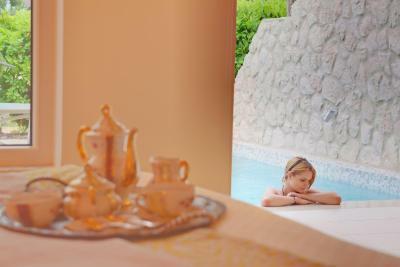 LITOΗORO OLYMPUS RESORT VILLAS & SPA is located in Plaka, 2 km away from the well-known, traditional and historic Litohoro, and it is a small heaven by the sea (60 meters from it), which loves perfection, as every paradise does. The unrivalled view to the sea is the first thing that will attract your attention, with Olympus, the Mountain of Gods, in the background. Then, the baton in the game of impressions is passed to the fine decoration that you will see in every room, and especially in the luxurious Restaurant “ELIA”. The full equipment of the congress halls makes every event extraordinary, guaranteeing absolute success, as it offers a great combination of professional activity and vacations. Feel special, you deserve this, and your choice itself confirms that. 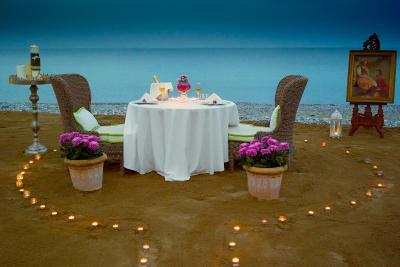 House Rules Litohoro Olympus Resort Villas & Spa takes special requests – add in the next step! Litohoro Olympus Resort Villas &amp; Spa accepts these cards and reserves the right to temporarily hold an amount prior to arrival. Litohoro Olympus Resort Villas & Spa accepts these cards and reserves the right to temporarily hold an amount prior to arrival. Pool temperature was a little chill however kids love it. 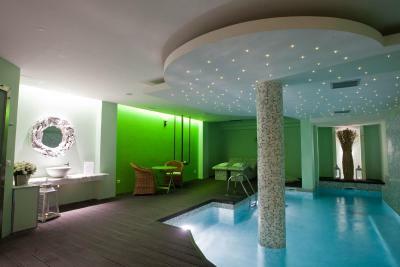 Great hotel and spa ! Bravo !!! 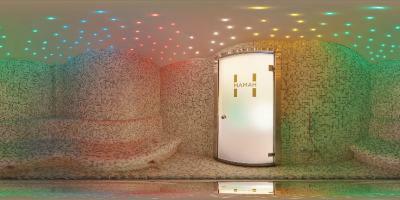 what was offered (private spa with hamman and sauna) and meal plan was not clearly expressed in english. Spa centre swimming pool was not worm enough. One hour using spa facilities was not enough. Breakfast is good, but coffee quality is pretty low. We asked for a cappuccino and an espresso that we paid separately 7 euro..
We can't speak highly enough of our stay at this wonderful place! The staff were incredibly attentive and welcoming. We'd like to mention the high quality service we received from the bar staff - Dimitris, Yannis and Stakis. The conversation was fun every evening over a Metaxa! We'd especially like to convey our gratitude to both Marias (affectionately known as Maria 1 and Maria 2), who went above the call of duty to make us feel welcome and provided us with local information and historical background. We look forward to seeing them again on our next visit! This fantastic accommodation has everything you could wish for! Extremely comfortable beds, lovely spacious rooms (ours had a wonderful sea view!) and the breakfast was plentiful, with plenty of variety. Finally, the icing on the cake was the wonderful pool and outdoor seating area and the private sauna/spa/steam room that were entitled to for one hour per day of our visit. Totally what the doctor ordered to leave us feeling totally relaxed! We will be back again soon! The staff were amazing and went out of their way to make every guest feel welcome. 1 night was just not enough. After travelling Europe for 5 weeks, this was the best place we stayed. Honestly cannot recommend enough. If the receptionist Maria ever sees this, THANK YOU!!! 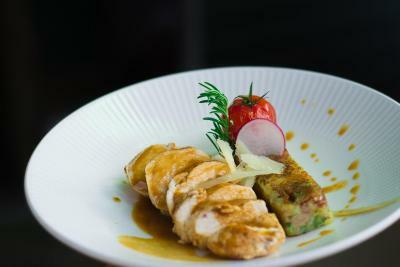 Great facilities, very helpful staff & excellent food. There are no things that I can say that I didnt like. It is very expensive. Could be a bit more affordable. The facility is beautiful, created for comfort and enjoyment. 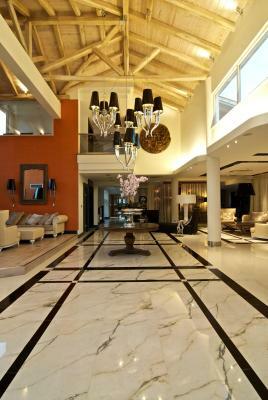 Definitely the most luxurious one in the area. 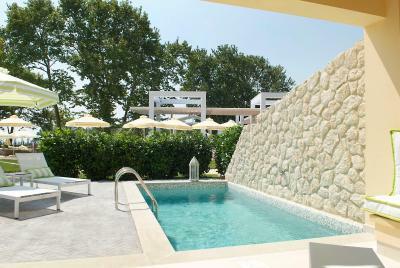 The rooms are well designed and the villas are made for romantic, relaxing gateways. The gardening is impeccable. The quality of the furniture and the details are great.